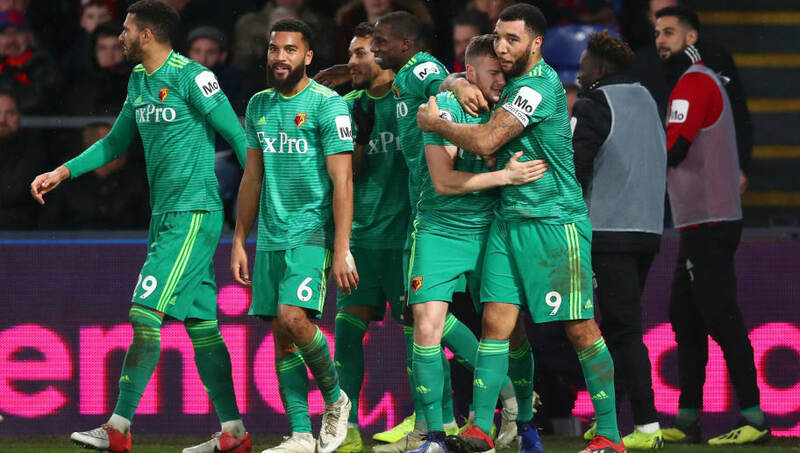 Watford came back from a goal down to win on Saturday afternoon, as they beat Crystal Palace 2-1 at Selhurst Park. The Eagles took the lead before half time, as a messy goal line scramble saw the ball bundled in off a clueless Craig Cathcart to give the home side the lead. However Cathcart redeemed himself on 67 minutes, as his looping header found the back of the net to draw the Hornets level. Watford then turned the game around seven minutes later, as a fantastic volley from Tom Cleverley found the top corner. The win ended a streak of four league games without victory for Watford, as they took all three points in a crucial win in south London. ​Crystal Palace showed quality throughout the game, as they aimed to make it three wins from three in 2019. It looked like that would be the case as they took the lead before half time, and controlled the game throughout the second half. However as soon as Cathcart equalised the Eagles looked shellshocked, and mistakes started to slip in. Palace ultimately lost three points in the space of seven minutes, and they will be frustrated with themselves for allowing Watford back into the game to win it. Starting XI: Guaita (6); van Aanholt (6), Sakho (6), Tomkins (6), Wan-Bissaka (7); McArthur (6), Milivojevic (6), Kouyate (7); Zaha (6), Ayew (5), Townsend (6). Substitutes: Hennessey (6), Benteke (6), Schlupp (N/A). STAR MAN - Playing in the centre of midfield, Cheikhou Kouyate was very good for Crystal Palace. He was key in putting a halt to Watford's attacks, and was everywhere for the Eagles in a strong performance, despite the result. WORST PLAYER - Although he made no mistakes nor missed any big chances, Jordan Ayew was underwhelming for Crystal Palace. After scoring two goals in two games this year, he was very quiet on Saturday and didn't offer much going forward for the Eagles. Watford played well throughout the game, as they were disciplined and organised in defence and good going forward. Despite a lacklustre first half in which none of their seven shots were on target, they deserved the win in the end. The Hornets didn't give up as they battled to find a way back into the game, and goals from Cathcart and Cleverley were deserved fas Javi Gracia's side took all three points at Selhurst Park. Starting XI: Foster (7); Holebas (6), Cathcart (7), Mariappa (6), Femenia (6); Pereyra (6), Capoue (6), Doucoure (7), Hughes (N/A); Deeney (6), Deulofeu (5). Substitutes: Sema (6), Cleverley (7), Masina (N/A). STAR MAN - In a game of little individual quality for Watford, Ben Foster was once again key. The Hornets goalkeeper made a number of important saves to keep his team in the game, and in doing so he definitely helped Watford to an important victory. WORST PLAYER - Despite having numerous chances, it just wasn't Gerard Deulofeu's day. The Spaniard had a string of big opportunities throughout the game, but it clearly wasn't to be as he struggled to get his efforts on target, let alone into the back of the net. Crystal Palace face two tough challenges in the next two weeks, starting with a trip to league leaders ​Liverpool next Saturday. They are then back at Selhurst Park in the FA Cup fourth round, when they host ​Tottenham on 27 January. Watford are also back in action next Saturday, when they host ​Burnley at Vicarage Road. They then face an away trip in the FA Cup, travelling to either ​Newcastle United or Championship side ​Blackburn Rovers on 26 January.